After sharing the make-ahead pasta salad jars with you all on Instagram last month, I realized one thing: I’m not the only person who struggles with packing lunch. And not just school lunch, but also adult lunch. It’s so easy to get caught up in packing lunches for our kids that we forget about ourselves. This happens so often in life, particularly as a mom. I know this has been true in my own life. I get so focused on taking care of everyone else–the dog, the hubby, the kids–that I forget to take care of myself. Last year I made the decision to make self-care a priority. For me, this looks like getting to bed early so I’m well rested the next morning (which also means getting the kids to bed earlier), waking up early so I have a few minutes to enjoy my coffee before the kids wake up, masking and exfoliating a couple of times a week (I love a good, relaxing spa treatment), and prepping my lunches in advance so my body is nourished and cared for throughout the week. I think people oftentimes picture self-care in the form of a spa appointment or a vacation. While self-care can definitely mean spa time or a well-needed vacation, it doesn’t have to be that fancy. Self-care can be as simple as getting in a good breakfast, prepping a nourishing lunch ahead of time, or sitting down to a dinner with the people we love. Nourishing our bodies with good food is the ultimate form of self-care. 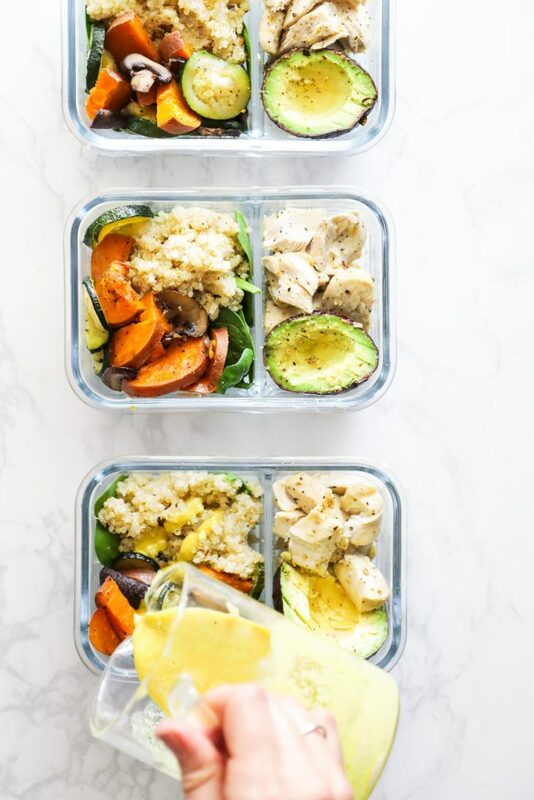 This make-ahead lunch is made up of a few basic meal components: marinated chicken, veggies (a variety of veggies work), quinoa (any grain works–millet, buckwheat, rice, etc. ), a homemade tahini dressing, and some baby greens (arugula or spinach work well). The components come together to form a bowl-style meal, oftentimes referred to as a “grain bowl” or “nourish bowl”. 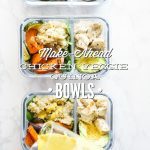 I like to prep these bowls in Prep Natural containers, but any divided, bento-style box will work. The components may also be kept separate and assembled before serving. This prep-ahead, sheet-pan meal is easy to make for real-food meals on the go. Combine the marinade ingredients (olive oil, lemon juice, minced garlic clove, salt, and pepper) in a bag or shallow container. Place the sliced chicken in the marinade, and then place the bag or container in the fridge for at least 30 minutes. Cook the quinoa while the chicken is in the fridge. Using a fine mesh sieve, rinse the quinoa under fresh water until the water runs clear (about 1-2 minutes). 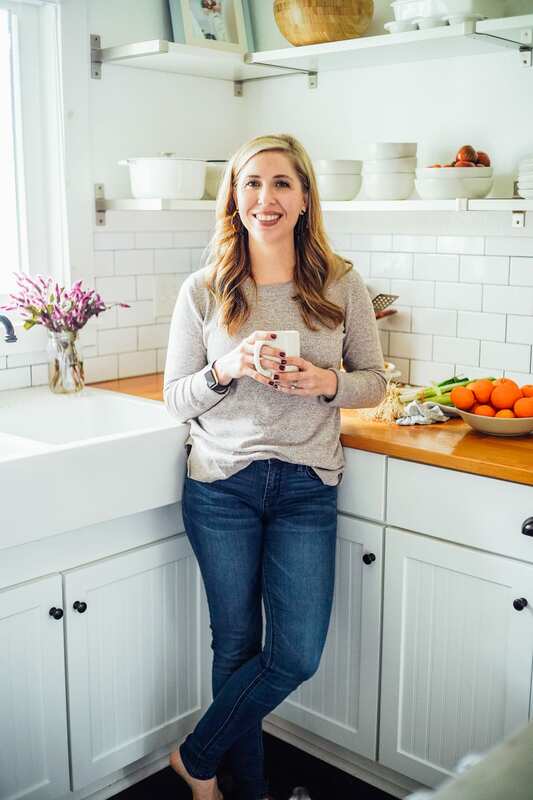 Pour the water or broth, rinsed quinoa, and salt into a medium-size saucepan. 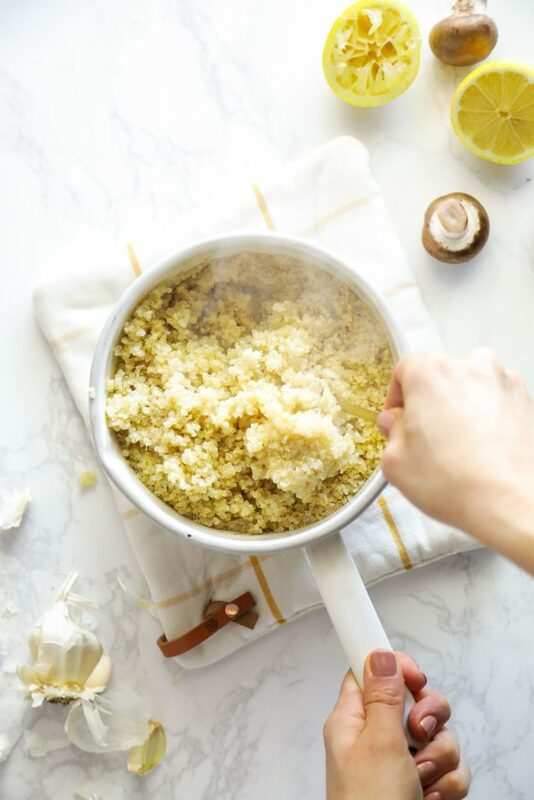 Bring the mixture to a boil, cover the pan, then reduce to a lively simmer until the quinoa absorbs the water (about 15 minutes). Remove the saucepan from the heat. Fluff the quinoa with a fork. Set aside. Arrange the veggies in a single layer. Drizzle the veggies with olive oil, salt, and pepper. Toss to combine. 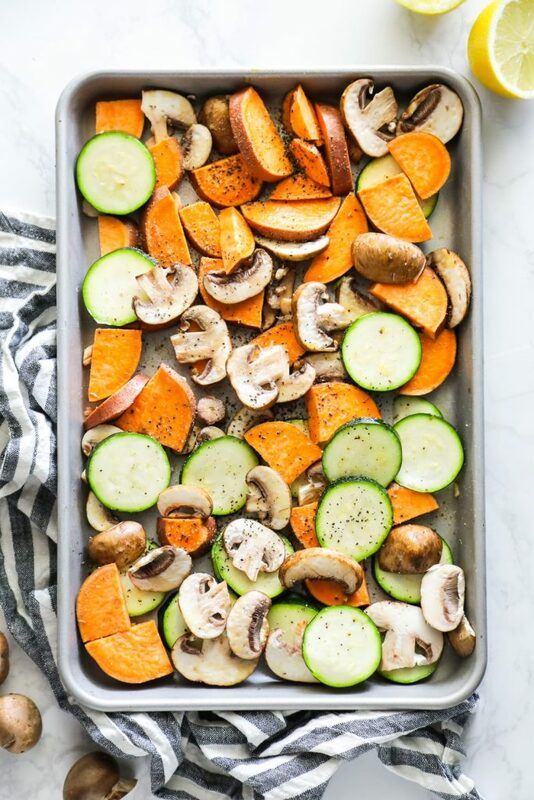 Bake the veggies for 20-25 minutes, until slightly soft. 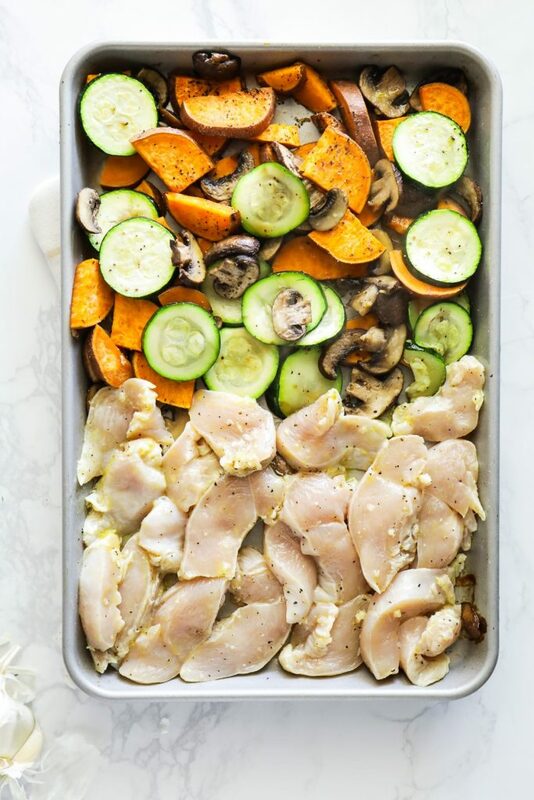 Remove the sheet pan from the oven, and gently push the veggies to one side to make room for the chicken. Remove the sliced chicken from the marinade and place on the sheet pan, discarding the extra marinade. Bake for 15 minutes, or until the chicken is cooked through and the sweet potatoes begin to crisp on the edges. While the veggies and chicken cook, make the salad dressing. Add the olive oil, lemon juice, tahini, apple cider vinegar, garlic, salt, and pepper to a small jar (an 8-ounce mason jar works well). Seal the jar with a lid, and shake to combine the ingredients. 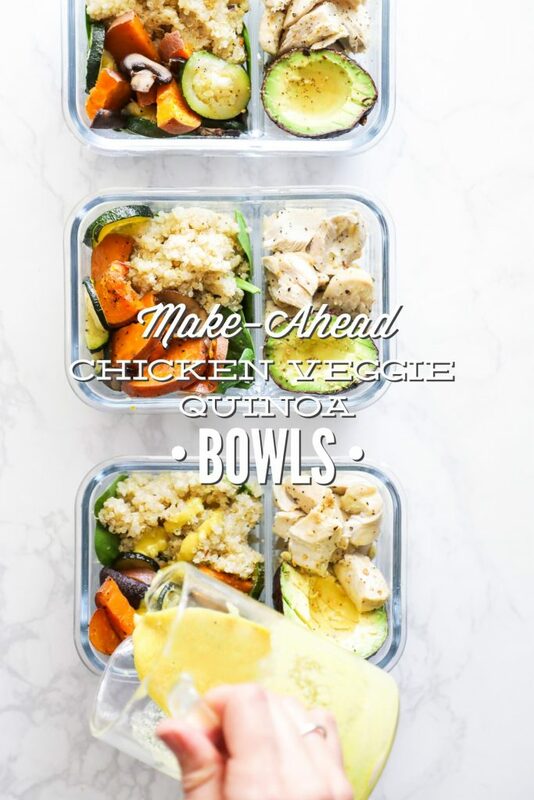 Place ½ cup of baby spinach on the bottom of meal prep containers, followed by the veggies and chicken. The meals will keep in the fridge for about 4 days. Before serving the lunch (or the morning of), cut an avocado in half and sprinkle it with a small amount of lemon juice (about a ¼ of a lemon) and a pinch of salt. 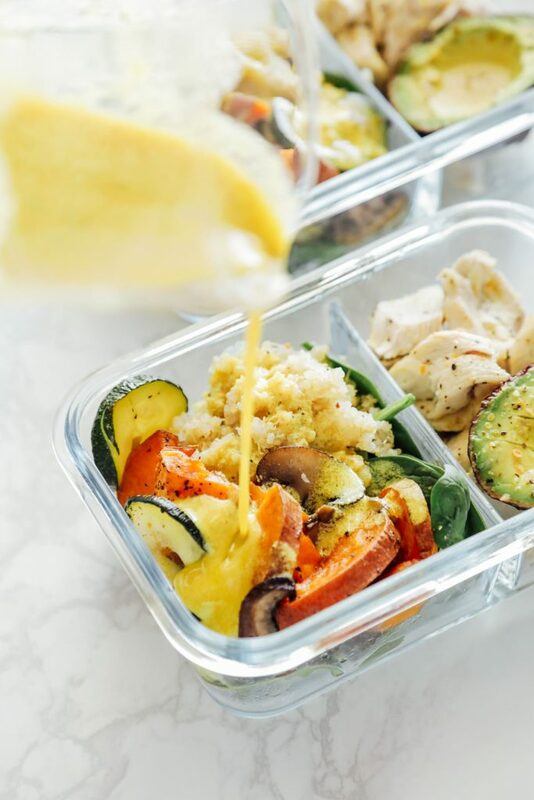 Pour as much dressing (shake first) as desired over the chicken, veggie, spinach, and quinoa. Take the meal to go, or enjoy that moment. I like to eat this meal at room temperature. You could also heat it up, if desired. Just remove the avocado before heating. *Make sure the sweet potato slices are relatively the same size to ensure even cooking. The ingredients in this make-ahead meal are hearty, so I’ve found that prepared bowls will keep in the fridge for about 4 days. 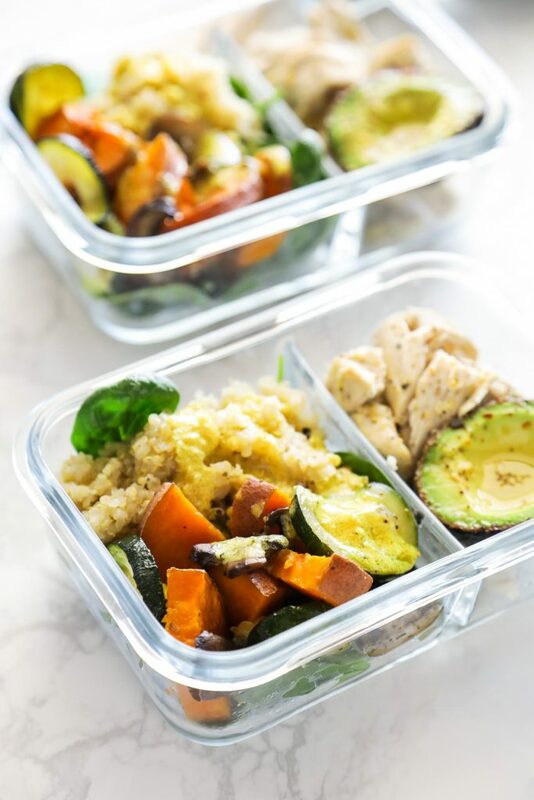 If you don’t want to assemble the components into a make-ahead meal, I recommend storing each meal component--quinoa, veggies, chicken, dressing--in separate containers until you’re ready to make a bowl. This chicken isn't "crispy" on the outside, rather, it's more like a poached/steamed chicken. If you'd like a crispy, brown crust on the chicken, I recommend grilling or pan-cooking the chicken instead of cooking the chicken on the sheet pan. Follow all the directions, above, and simply add the chicken to the grill or a hot skillet and cook until done. If you grill the chicken, you'll want to leave the chicken whole while you marinate and cook it. Slice it up after grilling. Vegetarian Note: If you would like to make this meal vegetarian-friendly, add a can of drained and rinsed chickpeas (or freshly-cooked chickpeas) to the sheet pan at the same times as the veggies. Toss everything in olive oil (you may need to use olive oil), and bake until the veggies are soft and chickpeas are crispy. I use divided containers (pictured) from Prep Naturals to assemble the components ahead of time for lunches. Salad dressing recipe inspired by the tahini dressing here on Live Simply and Sprouted Kitchen's tahini turmeric dressing. Yay, Hollie! I’m so glad you’re enjoying this lunch. 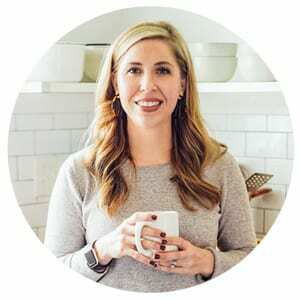 What a great idea to cook the quinoa with herbs in the Instant Pot. How long did you cook the quinoa? I’m definitely going to try that! Question thou. Is the calorie count per serving?! Or total prep? Hey Megan, I’m so glad you’re enjoying the bowls! The calorie count is for each lunch. The count will definitely depend on the amount served in the lunches–as you noticed each lunch is quite hearty. I’m pretty sure the avocado raises this calorie count, since avocados are so nourishing and full of so much amazing fat. Your recipes are just amazing! I give them to my patients on the daily. I love how easy it is to navigate your website too! thank you for all that you do! Thank you so much, Emily! I’m so glad you’re enjoying the recipes, and thank you so much for giving them to your patients–I’m honored! !